Asteroids are also known as minor planets. They can range in size from approximately 1000 kilometers in diameter to the size of a stone. The largest asteroid in our solar system is Ceres; with a diameter of about 950 kilometers it is large enough to be considered a dwarf planet. Off the millions of asteroids in our solar system only about 30 have a diameter greater than 200 kilometers. The rest are much smaller, most likely resulting from the collisions of larger asteroids. 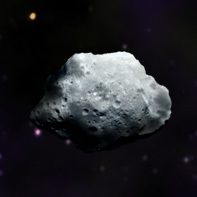 C-type asteroids are made up of a considerable amount of carbon and other complex organic (carbon containing) compounds. 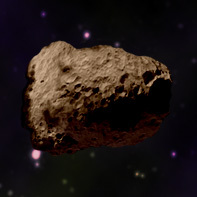 They are dark in colour and most noticeable in the outer part of the main asteroid belt. These asteroids are relatively bright and made up of silicate rocks with small amounts of iron. They are located mainly in the inner region of the main steroid belt. 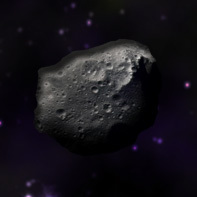 These asteroids have fairly bright surfaces and contain metals such as iron on their surfaces. They are found in the middle of the main asteroid belt. 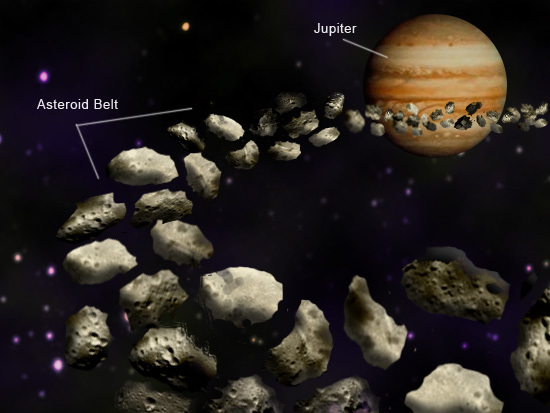 All the asteroids in the solar system are not restricted to the main asteroid belt. Some pass the sun more closely and thus also pass closely to the Earth’s orbit. Asteroids that pass to within 45 million kilometers of Earth’s orbit are call Near Earth Asteroids. The orbit of some of the steroids cross Earth’s orbit and they could therefore collide with the Earth in the future. One of the theories for the mass extinction of dinosaurs about 65 million years ago is that a large asteroid collided with the Earth causing disruption to the global climate. The Chicxulub crater in the Yucatan Peninsula in Mexico reinforces this theory and the asteroid collision is considered as one of the triggers for mass extinction of dinosaurs. There are several space programs dedicated to identifying, studying and monitoring these asteroids as they can pose a potential hazard to Earth.